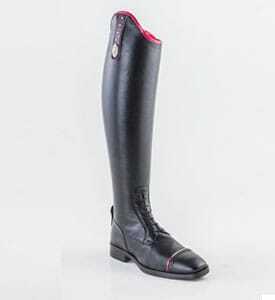 The De Niro Salentino Lucidi Boot adds the perfect touch to any competition boot with the stunning shiny crocodile effect can be either on the top only or top, toe and heel. 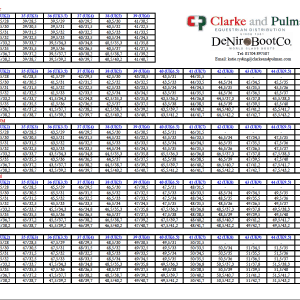 Categories: Salentino Boots, Feature Product. 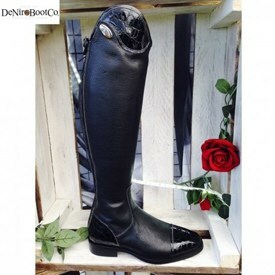 The De Niro Salentino Lucidi boot is a beautifully crafted long leather riding boot made from soft calfskin leather which adjusts to the shape of the leg with the silver De Niro badge on the side strap. 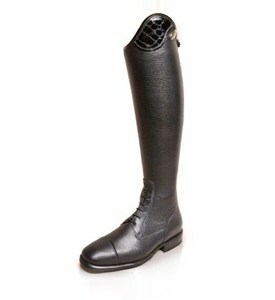 The boots feature intricate stitching on the lower portion of the boot and a cushioned sole offers extra comfort. 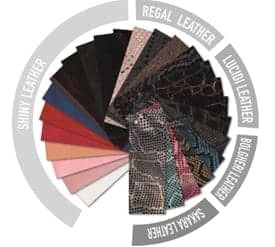 The lucidi design is a patent croc pattern which looks stunning on the top of the boot. The Lucidi can also feature on the top, toe and heel of the boot to stand out from the crowd! The De Niro Virbram sole can be added to the boot at the checkout, which is more hardwearing than the sole provided due to being made of leathers and rubber. They are finished with a full rear zip with top zip guard and an elastic panel for a comfortable fit. 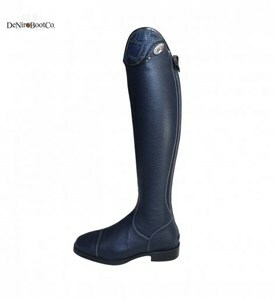 Please note that this panel may provide between 2-3cm extra room when stretched on the calf. An additional bottom zip can be added to the boot to prevent mud and first from entering the zip. 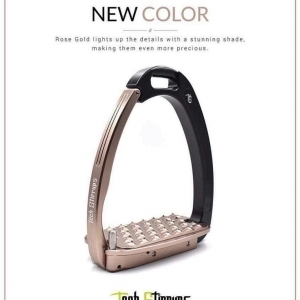 The De Niro spur studs can also be added to the boot to ensure spurs stay in the correct position. 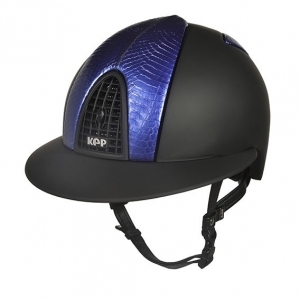 We have also have the option to add a smooth WRAT leather panel on the inside of the leg making them more hardwearing for the competitive rider. The boot leather is available in black, brown or blue. These boots feature De Niro’s WRAT technology using hydrophobic materials that are bonded to the leather structure during tannage to form a protective water, wind and crack-resistant barrier. They are available with laces and without, please select which option when checking out. 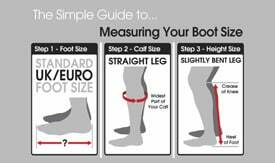 Available in a range of sizes, please see the sizing guide to check your measurements. There is an 6-8 weeks delivery time for these boots. We offer a 50% deposit on all orders, please contact us to arrange this. 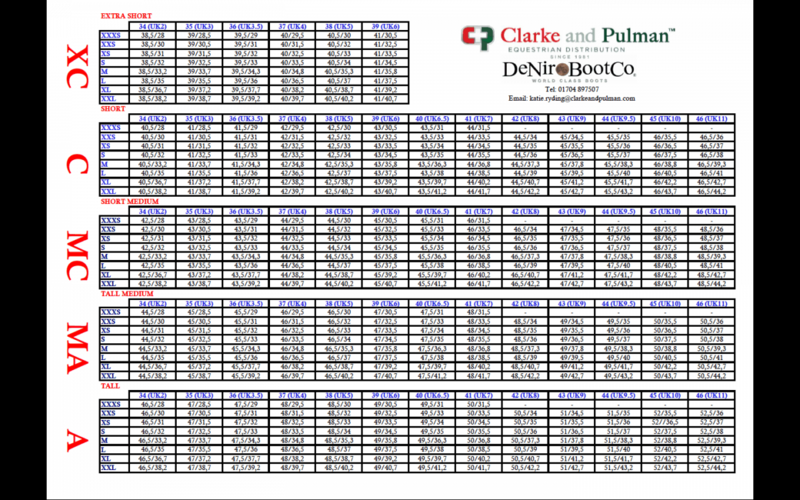 If you would like any assistance when purchasing the boots, please do not hesitate to contact us.